Increasing customer demand has led us to add four new languages to expand our international reach. We will continue to invest in the global functionality of our training program that has been specifically designed for how people learn and work. Security Mentor, a pioneer of innovative security awareness training that drives real behavior change, today announced the localization of the Security Mentor Security Awareness Training Program in four new languages to enable global businesses to better protect themselves against phishing, social engineering and other information security threats. The addition of Portuguese, Italian, Chinese and Swedish adds to an already robust collection of languages supported by Security Mentor, with more languages to be introduced throughout the rest of the year. With a substantial increase in cyber-attacks, use of personal devices at work, and access by employees to sensitive corporate information, the need to create a secure, global workforce has never been greater. As organizations face an influx of both internal and external attacks, security awareness training has moved to the forefront of the corporate discussion and remains critical to businesses of all sizes worldwide. Security Mentor addresses the needs of multinational corporations by providing not only specific languages, but also region-appropriate examples and dialogue. With the addition of four new languages, Security Mentor continues to expand the industry’s most comprehensive security training program that enables organizations to create cyber-savvy employees. Combining engaging, highly interactive lessons that convey critical security information in an easy-to-understand, brief format that is both fun and memorable, Security Mentor drives real, immediate employee behavior change. Security Mentor will be hosting a booth at RSA Conference USA 2016 (#S838) where subject-matter experts will discuss the latest company updates, as well as the benefits of interactive, highly engaging, security awareness training. For more information on Security Mentor, visit the company’s website, and follow the company on Twitter at @SecurityMentor and LinkedIn. Security Mentor’s groundbreaking and award-winning security awareness training elevates security and compliance by transforming your workforce into security savvy employees. With only 10 minutes/month, our interactive, highly engaging lessons teach critical security skills in an easy-to-understand, fun format that drives real behavior change. The result: an engaged staff that values security. Security Mentor’s training is available as a cloud-based service from Security Mentor with username/password authentication or Federated Single Sign-on (SSO), or as SCORM 1.2 compliant modules for use on an organization’s own Learning Management System (LMS). Incorporated in 2008, Security Mentor has customers ranging from Fortune 500 enterprises to local and state governments. 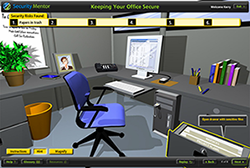 To learn more, view our two-minute introductory video or request a demo at http://www.securitymentor.com.